"Brimming with lime-hued succulents and a lush collection of agaves, one shooting spiky leaves 10 feet into the air, it's a head-turning garden smack in the middle of Long Beach's asphalt jungle. But the gardener who designed it doesn't want you to know his last name, since his handiwork isn't exactly legit. It's on a traffic island he commandeered." 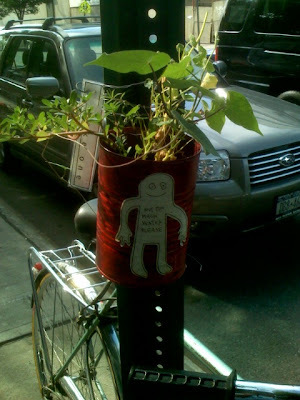 Guerilla gardening. I've never been more delighted to see two words brought together! According to the LA Times, there's a growing movement of people who've started planting gardens on public land. They're taking over traffic islands and empty lots--or any urban space that could use a little green. Much of their work is done under cover of night, when the authorities aren't watching. (You'd be surprised by the problems a few pretty plants can cause.) As traffic streams by, they take out their shovels or pelt neglected land with seed bombs. They leave behind little gardens that make the city a more enjoyable place to live. 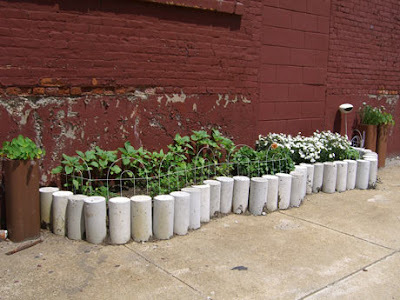 You can read the original article (which includes handy tips for making seed bombs) here or check out the guerilla gardening movement right here in New York! THATS SO RAD ^^ !!! since i'm going to a big city pretty soon, maybe i could try gurilla gardening (although i highly doubt anyone would notice a little extra green in portland oregon). speaking of portland oregon, ananka, you should DEFINATLEY (did i spell that right?) come to portland oregong somewhere around... 2 weeks from now. that would be fantastic!!!! then you should definatley (?) travel the rest of the west coast, satisfying your other fans dreams to visit them over here. Lol I wanna do that, but I live in a pretty rural area,(where there are cows, sheep, and chickens!) so there are plants and trees everywhere. Haha. When I first saw the post, I thought the title said "Gorilla Gardening". Wouldn't that be interesting? lol, tht was the samething I thought Raph! XD I was like "'Gorilla Gardening??' How did Ananka find that!?!? OoO"
Kitty: I love chickens, cows and sheep. How lucky you are :)! This is good. It's something illegal, but positive for the environment. No guilt! But who waters and looks after these plants? Obviously, the authorities won't take liability for the plants, as they aren't theirs. Peeping Toms from OUTER SPACE! Too Good To Play With the Boys?